For all our resellers, we offer a program with discounts on all orders! Get discounted price list from day one. With growing volumes, you will get even better prices. As an ICANN accredited registrar, Name SRS can help you register in all open TLDs in the world. We offer domain name management for resellers, based on a powerful platform - including advanced control panel and API. Carefree and simple management of your domain names! 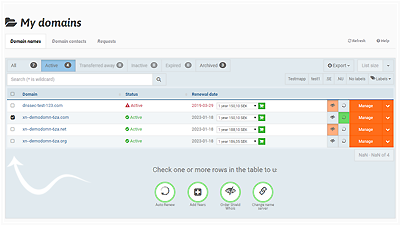 All gathered in the same domain portfolio, full control and settings for auto renewal. All top level domains - all in one place! With our advanced DNS editor, we offer probably the best DNS management you can find. Our proprietary editor offers all the features you need, importing data and giving you fast and easy DNS management. Our Premium DNS service, offers global anycast solutions with robust infrastructure, including name servers that are connected to several operators simultaneously through the use of IP Anycast technology. Name SRS offers a simple handling for DNSSEC in the control panel - one click solution! With DNSSEC, all DNS lookups are signed with cryptographic keys and in this way it is ensured that the answers actually come from the right source and have not been changed during the transfer. Our team with established lawyers, can assist you and your customers in important issues regarding legal disputes for domain names. We help companies all across the world, look after their brands online and enforce their rights when necessary. Trademark Clearinghouse (TMCH) is a database that will increase the protection of trademarks on the Internet. A central repository for information about brands and their owners, to be verified, stored and disseminated. DMPL is a possibility to block your name in hundreds of top level domains. Become a reseller? Contact us!